Do you wish your pre-workout supplement gave you more focus and motivation to train? Do you wish it gave you noticeably better workouts and helped you hit PRs? If you’re nodding your head, then you’re going to love this stimulant-free version of PULSE. You see, when we set out to create it, we wanted to accomplish several things. We wanted to boost workout performance without any stimulants. Many people also exercise in the late afternoons and evenings, and even a small amount of caffeine taken before these workouts can be enough to ruin their sleep later that night. Furthermore, many people enjoy caffeine and tolerate it well, but would prefer to consume it in other ways than a preworkout supplement (coffee and tea, for instance). 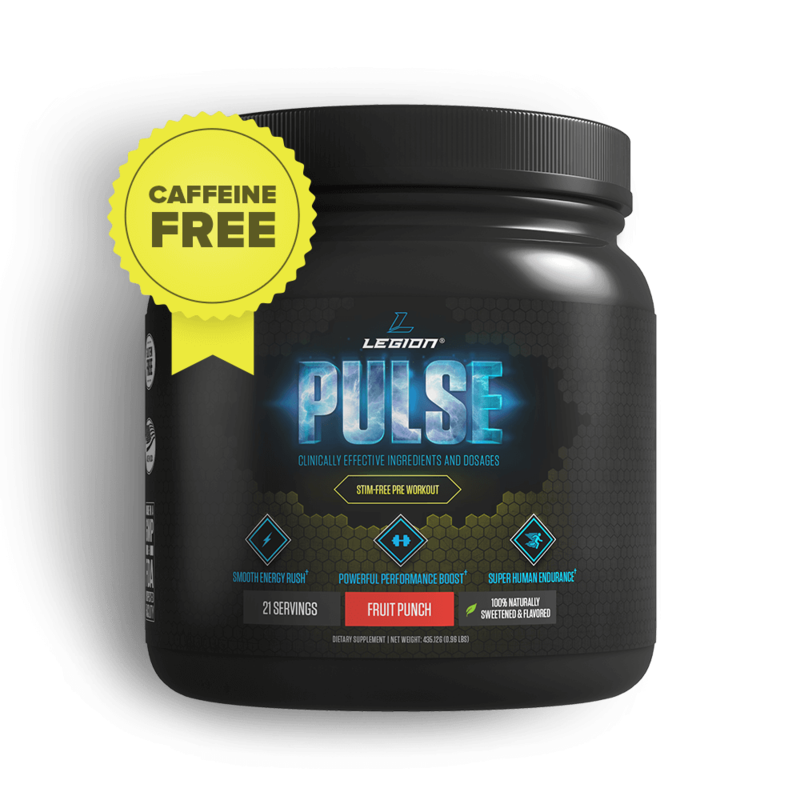 All that's why this version of PULSE contains absolutely no stimulants, which means you get to reap all the performance benefits while also being able to choose exactly how much caffeine you have every day and when you have it. If you’re like us, training is more than just moving your body. That’s exactly what you get with PULSE. Not so with this stimulant-free version of PULSE. It was carefully formulated so there’s no sickness, stomach pains, or uneasiness. We didn’t invent the pre-workout supplement. We just perfected it. First, PULSE doesn’t contain a concoction of cheap and potentially dangerous stimulants that shock your nervous system and turn your stomach. In fact, this version doesn't contain any stimulants whatsoever, so you never have to worry about after-effects like the dreaded "postworkout crash". The real “magic” of PULSE, though, is in its unique combination of natural substances scientifically proven to increase strength, endurance, focus, and mood. These key ingredients include citrulline malate, beta-alanine, Alpha-GPC, and betaine, and each is backed up by peer-reviewed research demonstrating clear benefits. The clinically effective dose of citrulline malate ranges from 4 to 10 grams per day. This is one of the ways that muscles become fatigued. 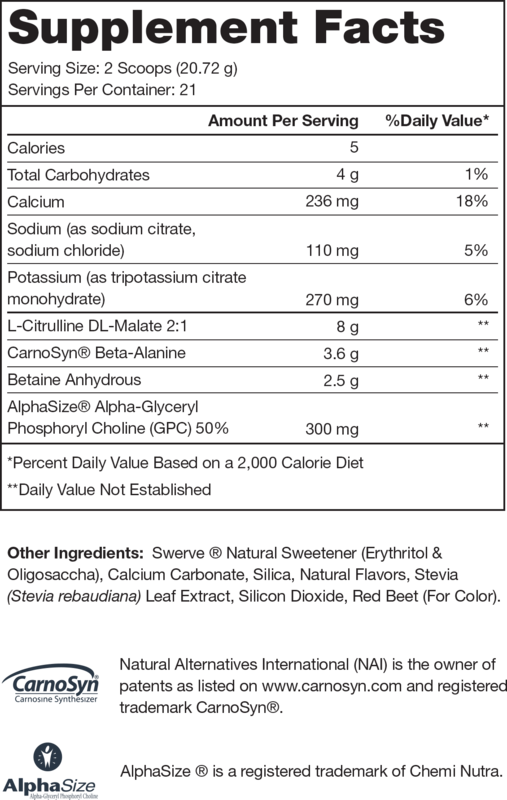 PULSE CONTAINS 3.6 GRAMS OF BETA-ALANINE PER SERVING. The mechanism of how it accomplishes this isn’t fully understood yet, but several hypotheses are being investigated. The one currently considered most correct relates to the “cellular swelling” effect of betaine, which protects cells from exercise-induced damage and thus improves performance. It isn't gobbled up by the choline-loving liver and thus can reach the brain and act on it directly. The clinically effective dosage of Alpha-GPC is between 150 and 1,200 milligrams, with the range of 150 to 300 milligrams sufficient for cognitive benefits and higher dosages required for affecting dementia. If you compare PULSE’s formulation to anything else on the market, you’ll quickly see that it’s second to none. What makes it even better, though, is what we left out. That’s why we’ve chosen to go with the natural sweeteners stevia and erythritol instead. Research shows that not only are they safe, but they can also confer several health benefits, including a lower cholesterol profile, improved blood glucose control, potential anti-cancer effects, lower blood pressure and inflammation levels, and more. As with artificial sweeteners, the consumption of azo dyes might not be as harmful as some would have you believe, but there is evidence that these chemicals can cause various negative effects in the body. PULSE also isn’t full of cheap carb powders or other fillers. While eating carbs before working out is an easy way to boost your performance, we don’t believe that carb powders belong in pre-workout drinks. You can just eat food for that. The only “filler” you’ll find in PULSE is about two grams of maltodextrin per serving, which is necessary for improving taste and mixability and preventing clumping. Compare that to the nearly 20 grams of active ingredients in each serving, though, and you’ll see how insignificant it really is. PULSE sharpens mental focus, increases strength and endurance, and reduces fatigue...without unwanted side effects or the dreaded post-workout crash. Every ingredient is backed by peer-reviewed scientific research and is included at clinically effective levels. This version of PULSE also contains no stimulants, which means you get to reduce or restrict your caffeine intake as desired. PULSE is 100% naturally sweetened and flavored too. It contains no chemical dyes, cheap fillers, or other unnecessary junk, so you don’t have to worry about potential health effects. If you want to feel focused, tireless, and powerful in your workouts…and if you want to say goodbye to the pre-workout jitters, upset stomachs, and crashes for good…then you want to try PULSE. 1. Effects of L-malate on physical stamina and activities of enzymes related to the malate-aspartate shuttle in liver of mice. 2. Effects of caffeine ingestion on rating of perceived exertion during and after exercise: a meta-analysis. 3. Citrulline and the gut. 4. Citrulline malate enhances athletic anaerobic performance and relieves muscle soreness. 5. Citrulline malate limits increase in muscle fatigue induced by bacterial endotoxins. 6. Citrulline malate supplementation increases muscle efficiency in rat skeletal muscle. 7. Citrulline/malate promotes aerobic energy production in human exercising muscle. 8. Effects of citrulline supplementation on fatigue and exercise performance in mice. 9. Influence of oral beta-alanine and L-histidine supplementation on the carnosine content of the gluteus medius. 11. β-Alanine ingestion increases muscle carnosine content and combat specific performance in soldiers. 12. beta-Alanine supplementation augments muscle carnosine content and attenuates fatigue during repeated isokinetic contraction bouts in trained sprinters. 13. Effects of beta-alanine supplementation on the onset of neuromuscular fatigue and ventilatory threshold in women. 14. The effect of beta-alanine supplementation on neuromuscular fatigue in elderly (55-92 Years): a double-blind randomized study. 15. Short-duration beta-alanine supplementation increases training volume and reduces subjective feelings of fatigue in college football players. 16. Influence of beta-alanine supplementation on skeletal muscle carnosine concentrations and high intensity cycling capacity. 17. Effect of β-alanine plus sodium bicarbonate on high-intensity cycling capacity. 18. Six weeks of high-intensity interval training with and without beta-alanine supplementation for improving cardiovascular fitness in women. 19. Effects of beta-alanine supplementation and high-intensity interval training on endurance performance and body composition in men; a double-blind trial. 20. Effects of β-alanine supplementation on exercise performance: a meta-analysis. 21. Effects of beta-alanine on muscle carnosine and exercise performance: a review of the current literature. 22. Effects of β-alanine supplementation on performance and body composition in collegiate wrestlers and football players. 23. Effect of slow-release β-alanine tablets on absorption kinetics and paresthesia. 24. The effects of chronic betaine supplementation on exercise performance, skeletal muscle oxygen saturation and associated biochemical parameters in resistance trained men. 25. Ergogenic effects of betaine supplementation on strength and power performance. 26. Creatine as a compatible osmolyte in muscle cells exposed to hypertonic stress. 27. Acute supplementation with alpha-glycerylphosphorylcholine augments growth hormone response to, and peak force production during, resistance exercise. 28. Cognitive improvement in mild to moderate Alzheimer’s dementia after treatment with the acetylcholine precursor choline alfoscerate: a multicenter, double-blind, randomized, placebo-controlled trial. 29. Glycerophosphocholine enhances growth hormone secretion and fat oxidation in young adults. 30. Evaluation of the effects of two doses of alpha glycerylphosphorylcholine on physical and psychomotor performance. Journal of the International Society of Sports Nutrition. How does PULSE compare to other popular pre-workouts? The first thing you’ll notice is PULSE increases strength and endurance, reduces fatigue, and sharpens mental focus without the unwanted side effects or crash. This crash is usually caused by the type and amount of stimulants found in many pre-workouts, which are also known to cause anxiety, headaches, and stomach aches. What this comes down to is your workouts are going to be significantly better than they are with other pre-workouts. You’ll push more weight, get more reps, and leave with a bigger pump. This is because each ingredient in PULSE is backed by sound scientific research proving its performance benefits and included in the dosages required to actually deliver on them. We hear from first-time PULSE users every day that say they’ll never try another pre-workout again. It’s really that good. What type of workouts is PULSE good for? One of the great things about PULSE’s formulation is it improves performance in both anaerobic and aerobic exercise. That is, it’s not just for weightlifting. It’s for cardio and endurance training, too. And that means that you can take it before a weightlifting workout and see benefits like increased strength and muscle endurance as well as before a cardio session and see benefits like increased intensity and endurance. The bottom line is whatever type of exercise you do, PULSE is going to help you do it better. Why doesn’t PULSE have creatine? Creatine is a “must-have” supplement for people wanting to gain muscle and strength. It’s cheap, it’s safe, and it works. Period. It’s for these reasons that we chose to include 5 grams of creatine in every serving of our post-workout recovery supplement RECHARGE and exclude it from PULSE. PULSE only has 6 ingredients. Other pre-workouts have 10, 15, and some even more. What gives? Another thing to consider is that many molecules purported to help with performance simply don’t have the scientific evidence to back it up. Some examples are L-arginine, tyrosine, B vitamins, branched-chain amino acids, L-norvaline, and evodiamine. In the case of PULSE, however, each ingredient was carefully chosen based on scientific proof of safety and effectiveness, which naturally limited our choices. Is PULSE suitable for women? Definitely. Women can benefit from this stimulant-free version of PULSE just as much as men! PULSE is kind of expensive. Why should I buy it over cheaper alternatives? You can certainly find cheaper pre-workouts, but what are you getting for your money? High-quality ingredients are included in small (and sometimes miniscule) dosages that are far below the clinically effective levels. There are ingredients with little or no scientific evidence proving their benefits. Each ingredient is backed by well-designed, peer-reviewed research that you can review at the bottom of each product page. PULSE is also naturally sweetened and flavored and has no artificial food dyes or unnecessary fillers, which helps you limit your exposure to these chemicals. In the case of PULSE, when you compare it to other pre-workout drinks, it looks like ours has “super-doses” of various ingredients like citrulline malate and beta-alanine. These dosages aren’t inordinately high, though. These are the amounts required to noticeably improve workout performance. Will PULSE stimulate nitric oxide production? PULSE contains a clinically effective dosage of citrulline which is scientifically proven to dramatically increase nitric oxide production. What type of citrulline malate is in PULSE? 2:1, which is the form used in the vast majority of the studies proving its performance benefits. You’ll know PULSE is a real product the first time you use it. Simply put, you’ll see how training with a good pre-workout is supposed to feel. The only side effect that sometimes surprises people is an tingling feeling usually felt in the face. This is a harmless side effect of beta-alanine and isn’t an allergic reaction or cause for concern. Why is there less beta-alanine in the stimulant-free PULSE than the caffeinated version? We reduced the dosage of beta-alanine because a recent review of the beta-alanine literature by our scientific advisory board determined there are little to no additional performance benefits to taking more than 3.6 grams per day. In other words, as far as performance goes, 3.6 grams per day is going to be just as effective as 4.8 grams. The costs of including more in each serving are rather significant, however, as well as the degree of “tingles” that you’ll experience, which some people love but many dislike. A win-win if you ask us! Why did you remove ornithine and taurine from stim-free PULSE? Similarly, we removed ornithine and taurine to make a bit more room for a clinically effective dosage of Alpha-GPC, which is very expensive. We did this because we feel the benefits of Alpha-GPC outweigh the benefits of ornithine and taurine, and especially given the formulation and purpose of the product. And yes, we’re working on make these same changes in caffeinated PULSE (reducing the beta-alanine and dropping the ornithine and taurine so we can add Alpha-GPC). Why did you remove theanine from stim-free PULSE? Theanine is included in caffeinated PULSE because it makes the energy rush smoother and helps prevent a crash. By itself, however, theanine can have a calming effect, which is nice but not exactly what you want before an intense workout. Therefore, we removed it from stim-free PULSE. PULSE is too sweet/strong tasting for me. What should I do? Also, we have tweaked PULSE’s flavor profile several times since releasing it based on customer feedback, so please do let us know if you don’t like it. My bottle of PULSE has gotten slightly clumpy. Is it bad? Citrulline malate absorbs moisture and can become slightly clumpy after long periods of exposure to humidity. This doesn’t affect its quality or potency, though. Simply break up the clumps by shaking the bottle vigorously (or using a spoon if necessary) and you’re good to go. PULSE has calories. Will this break my fast? One serving of PULSE contains just 5 calories, which won’t raise insulin levels enough to break your fast. How does PULSE have 4 grams of carbs per serving but only 5 calories? Those carbs come from the sugar alcohol erythritol, which has fewer calories than the “normal” 4-calorie-per-gram carbs found in foods. Will I build a tolerance to PULSE? If so, can I do anything to prevent this? Your body won’t build any tolerances to any of the ingredients, which means that PULSE will continue improving your workouts for as long as you keep taking it. How many servings of PULSE can I take in one day? As this product is stimulant-free, there’s no clear, hard limit to how many servings you can take per day, but there’s no good reason to take more than one to two servings per day. Two of the amino acids in PULSE can come from animal sources.